Inada is a name that has become synonymous with massage chairs over the years. As the oldest massage chair company in the world, this is hardly surprising. Over the last 50 years, Inada has developed the knowledge to produce some of the most impressive and widely-celebrated chairs on the market. The Inada YuMe, however, is entirely different to anything else on the market. In this Inada Yume review, you’re going to discover why the Yu.Me defies comparison, and why it is the perfect massage chair for people with specific needs. 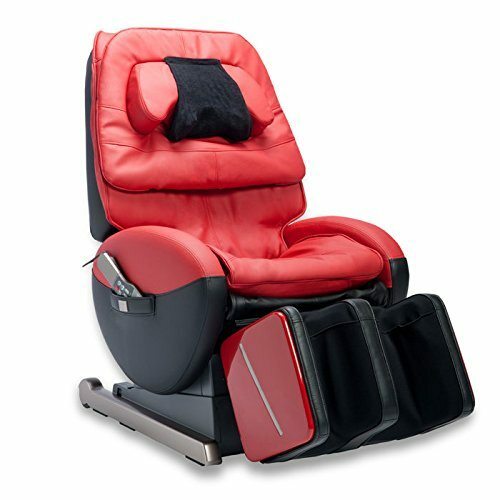 The Yu.Me massage chair is unlike any other on the market. Unlike the majority of massage chairs, which use a combination of rollers and air cushions to massage the body, the YuMe instead uses a unique combination of effects. The single most important of these is the gentle and methodical “rolling” of the chair. Like the gentle sensation produced by relaxing in a hammock on a summer’s say, or gently drifting to sleep on the train after a long day, this gentle rocking motion soothes and relaxes both the mind and body. Unlike the more well-known massage chairs such as the Dreamwave, with their pulsating air pockets, the YuMe is an altogether gentler and more sedate affair, perfect for those of a more sensitive disposition. Of course, the gentle rocking motion is far from the only element this chair offers. As with any other models from Inada, a gamut of features are present to help make your massage experience second to none. One element that Inada has become duly famous for over the years is their unique body-scanning technology, and it is this that creates a genuinely custom massage program. While other chairs try to offer the same massage experience to everyone, irrespective of who is using the chair, the Inada YuMe does something altogether more impressive. As you relax into its luxurious-feeling fabric, the YuMe actively scans your body, looking for specific Shiatsu pressure points. The massage offered is then customized to suit you personally, and consequently to target the specific areas of your body which will bring the most pleasure. Here it gently supports the body in a neutral position, rather than lying on your back in the swimming pool. Here your joints and muscles are relaxed yet supported, allowing the tension and discomfort to dissipate. Your neck is alive with nerves. It’s the reason so many of us feel tension or discomfort in our necks, and why even a few minutes of gently rubbing the back of your neck can feel so pleasant. It takes this principle a whole step further. As you sink back into the supportive shell of, Shiatsu cushions gently knead and rub your neck, helping to remove tension and discomfort. The cushions, which are designed to perfectly mimic the motions of a professional masseuse, can gently massage away discomfort and bring on a feeling of relaxation and well-being. As if all these features weren’t enough to make the YuMe a truly unique, it is also one of the few to offer its built-in light show. These LEDs are designed to produce a gently pulsing light show that relaxes the mind. Turn off the main lights in your living room and let your mind unwind and drift in response to the subtle light show. One of the most common questions we get asked about massage chairs pertains to whether they are safe to use or not when pregnant. That’s an excellent question and not one that has been authoritatively answered yet. It is, however, has been specially designed to be of benefit to ladies who are either pregnant or have recently given birth. The reason is that the YuMe has a far more gentle massage action than most other massage chairs on the market. The gentle rocking motion and zero gravity positioning are perfect for soothing the joint pain caused by pregnancy, as well as providing a reassuring and relaxing experience for both baby and mother. After all, gentle rocking is such a natural and therapeutic experience; it’s what most new mothers do anyway to help their baby to unwind and sleep better. If you or your partner are looking for a chair to use when pregnant, then the YuMe may be the best option on the market. My chiropractor has a massage chair. This chair is so much more versatile, IT PUTS THAT ONE TO SHAME, often making me WHIMPER into submission chanting INADA’S name, wondering HOW I could EVER have questioned the purchase price of this MASTERPIECE of technology. UPDATE: After 16 months of use, this works exactly like the day it arrived for my extensive daily therapy. The precious foot massage is the only thing saving my old arthritic feet. No mechanical problems with the chair have been encountered at all; no service necessary; no cause whatever for complaint. This chair, along with dutiful stretching exercises, appears to be a key to happy retirement for me. It’s WORTH THE MONEY! I’ve had my YuMe chair for eight months and I’ve used it every night before bed. This chair is sublime! I sit back, close my eyes and for 30 minutes plus I’m in an alpha state. Once done its right into bed for seven to eight hours of peaceful sleep. Previous to getting the chair my masseuse would arrive every Friday and spend 1 1/2 hours working me over, now it’s every other Friday and he is one of the best in the business here in Los Angeles. The YuMe is an average-sized chair. Unlike its big brother, the Dreamwave, you won’t need an excessive amount of space to house the YuMe. That said, it is important to remember that this is a “recliner” – so you will need to take into account the overall length when fully reclined. Also, as the world’s only “rocking” massage chair, you’ll want to site away from other household furnishings to avoid accidentally colliding with them when in use. The YuMe HCP-R100 weighs in at a not insubstantial 231lbs, with a length of 63″. This model measures 30″ in both width and height, enabling you to get some idea of the amount of space you’ll need to house this one at home safely. It is a truly unique model. For some people, the rocking action and LEDs will be far less appealing than some of the slightly more typical massage chair models. However for other people, and especially for nursing mothers, the unique features of Inada Yume can make it the perfect way to soothe away the aches, pains and stresses of everyday life, and to quickly and easily reach a sense of inner peace from the comfort of your own home.